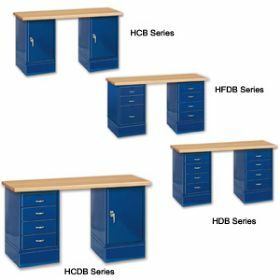 The perfect addition to your shop or maintenance area. 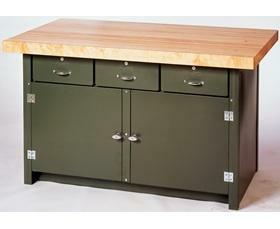 This spacious cabinet workbench features 16 cu. ft. of storage space in the 6' model and 12 cu. 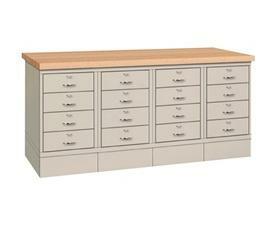 ft. in the 5' model as well as three locking bench drawers with pull handles and ball bearing drawer slides. 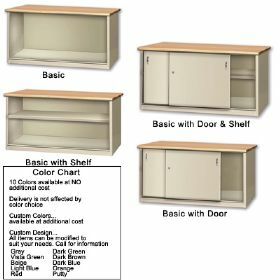 Has middle shelf with 9" of clearance, and (2) lockable T-handle cabinet doors. Laminated maple top offered in 1-3/4" and 2-5/8" thickness. Contact Dealer for Red Oak or 12 ga. top options. Available in Green or Gray please specify. 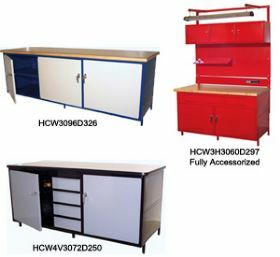 Additional colors available, contact dealer. Shipped KD. FOB Shipping Point.